In the current NAS market, it is downright impossible to talk of ARM and high performance together. The most powerful ARM-based NAS units have been based on Marvell's ARMADA processors. They usually come with dual gigabit network links and typically target the SOHO and low-end SMB market. Intel's offerings have had a virtual monopoly in the other tiers of the market. 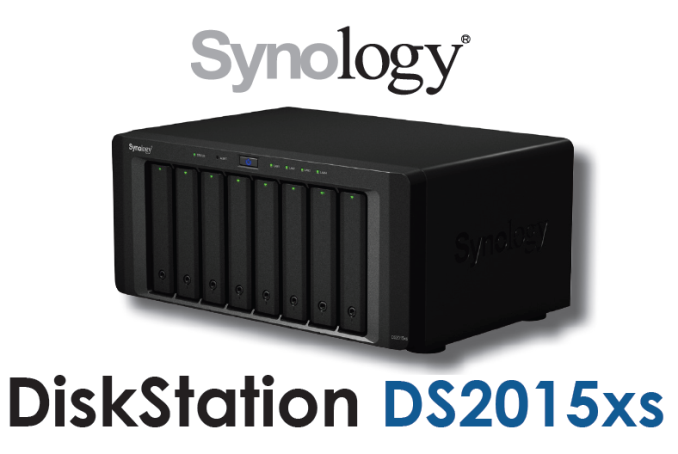 Synology is set to change all that with their latest offering - the DS2015xs with native 10G capabilities. The DS2015xs is 8-bay NAS unit presented as a step-up from the DS1815+. While the DS1815+ can expand up to a total of 18 bays with two DX513 expansion chassis, the DS2015xs is compatible with the 12-bay DX1215 expander (for a total of 20 bays). The main step-up from the DS1815+ is the presence of two built-in 10G SFP+ copper links. Claimed performance numbers include transfer speeds of up to 2000 MBps and 59K sequenital IOPS. Beyond these, details are scarce. We hope Annapurna Labs comes out of stealth mode soon and supplies us with more details. We might possibly be able to gather more information about the platform once we get the DS2015xs in hand. Moving on to the relevance of the AL-514 for the ARM ecosystem, it is clear that at least Synology considers it to be a worthy competitor to Intel's Rangeley. The DS2015xs is being positioned as a clear step-up from the Rangeley-based DS1815+. That said, the fact is that A15 is a 32-bit processor, and it is not entirely suitable (despite the LPAE extensions) for high-performance servers. ARM has since moved on to ARMv8 processors (true 64-bit) for both the smartphone and the server / communication infrastructure market. In other related news, Synology is also launching the DS3615xs, a native 12-bay desktop form factor solution (expandable to 36 bays with support for two DX1215 expanders). It is a straight-up upgrade to the previous-generation DS3612xs which used a Sandy Bridge-based Core i3-2100. The DS3615xs uses the Haswell Core i3-4130. It comes with four gigabit links, but also has support for a PCIe expansion card (to potentially add 10G capabilities). Like the previous generation xs-units, it comes with ECC RAM (4GB DDR3 by default, expandable to 32GB). Pricing and release date in the Americas for the DS3615xs is not yet available. 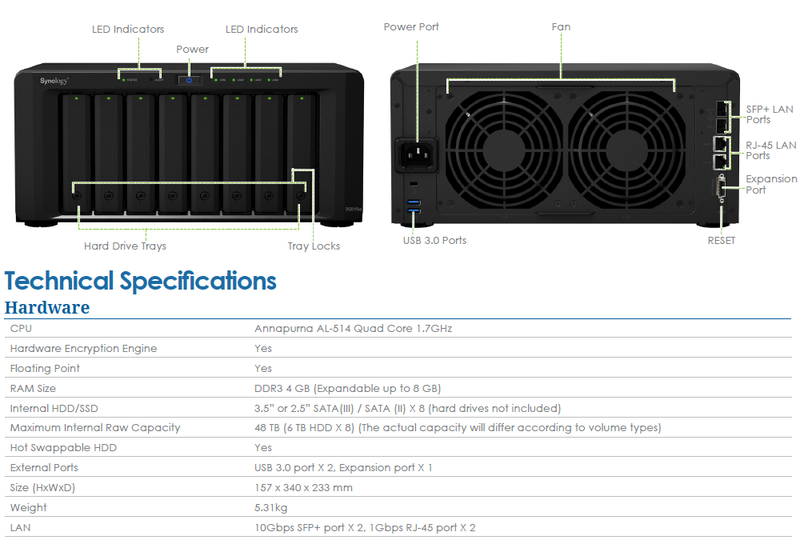 The DX1215 is a 12-bay expansion unit for select Synology DiskStation models. Unlike the eSATA-based DX513, the DX1215 connects to the main unit using Infiniband. Further details are available here. The DS2015xs will retail for $1400 - a price that really makes 10G affordable, while undercutting the introductory pricing of the previous generation xs units significantly. We have to admit that the xs positioning of the unit was initially very surprising. After all, the Cortex A15 really can't stand up to the Core i3 (on which the previous generation xs units have been based) in terms of raw CPU performance. There is no support for ECC RAM either. Synology clarified that the CPU performance would definitely not match up. However, the presence of communication and storage accelerators - particularly, natively integrated 10G capabilities, RAID acceleration and hardware-assisted encryption - enable the DS2015xs to support bandwidths that have typically not been reached at this price point. While the Annapurna AL-514 SoC seems more like a stop-gap solution for this market segment (particularly when true 64b ARM solutions are starting to make an appearance), consumers are fortunately shielded by Synology's DiskStation Manager (DSM) OS. The operating system manages to isolate the user experience with various NAS aspects from the underlying platform architecture. The end-user experience is the same, regardless of whether the NAS being used is based on ARM or x86. On the whole, Synology seems to have hit a home run with the price to performance ratio in the DS2015xs. We hope to soon have a unit in hand to test out how it performs with our standardized lab environment. We would also like to hear from readers on what sort of applications they are running on their Synology NAS units. This would help us determine how much of a performance difference there is between, say, the DS1815+ and the DS2015xs, for applications that matter to end users. If you use SSDs, the presence of two 10G SFP+ ports doesn't preclude the possibility of delivering over 2000 MBps of real world throughput for certain workloads. I used ISILON 6000 (5 nodes), and I could clearly state it's a joke. Hardware is basic PC hardware, including consumer-level hard-drives, and software was clearly a failure. Including not detecting not reporting faulty drives, except if you pay for support to have access to updated software. A real joke! As a side note, was years ago, costed more than 130K for 27TB storage, performances just fall when too loaded, then it takes it tens of minutes to crash!